One of the key new features that the new Android 4.4 KitKat OS brings is the new Google launcher which tries to being a unified Google experience to all. The Google Launcher puts the Google Now app at the fore front. And this would come as a real plus to those that use the Google Now app frequently as it makes the app more easier to access than ever. 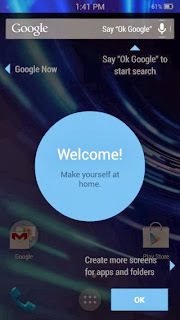 The Google Now app can now be activated by voice from the home screen by saying the hot word "OK Google". The need to have a Google Now widget has been removed as a swipe from the left to right on the Home screen brings up the Google Now app screen. If you would like to install this new app launcher on your Android device (limited to Jellybean devices for now) all you need to do is follow these easy steps below. 1. Download the Google Launcher zip from here. 2. Extract the files in the Zip archive to any folder on your device. 3. Install all the three files. 4. Chose the launcher as your default homescreen app. I did this on Friday and it worked like you said except Google Search did force close and I did the voice language change and it didn't fix it. I ended up having to go back to Factory defaults and reinstall everything. Not sure I want to try the new launcher again because of this. Although I did love the interface and experience.